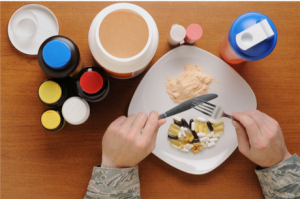 There are so many different vitamins and supplements on the market these days. So what brand or dosage do you buy? Do you buy a multivitamin and just hope it’s got everything you need in there? Or do you get a separate calcium, vitamin D, vitamin A, iron etc.? First things first, see your GP if you think you might need some supplementation. Often we can get what we need from changing our diet (that’s where we come in!) and we don’t even need supplements. Which is great because a lot of them hurt the wallet! Also remember, taking a vitamin or supplement doesn’t “make up” for a not so healthy diet, we still need a balanced diet. The amount of required nutrients depends on your age, gender and your medical/health status. If your GP or dietitian has suggested you take a supplement, try speaking to them or with the pharmacist about how much you really need. In this case, more is not better! There are actually no positives to taking more than what is recommended, in actual fact, sometimes we can take TOO MUCH and this can have negative health effects. Take Vitamin D for example, too much vitamin D (far exceeding 4,000 international units (UI)) can cause serious heart problems. Likewise, too much vitamin A can cause headaches, liver damage and reduced bone strength. These vitamins are fat-soluble, therefore when they build up in your body your body can’t simply flush out as you urinate, like other water-soluble vitamins. 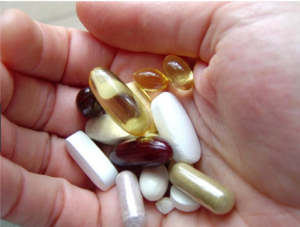 If you are taking other medications, take a blood thinner for example, the effectiveness of this medication might be hindered by your supplements. For this reason, asking the pharmacist about the drug interactions (making sure you state all of your medications and supplements) is really important. In Australia, we are lucky that supplementations are regulated. This cannot be said for the United States. So ensure you ask a pharmacist if you are thinking of buying a supplement off an international supplement store. To wrap up, make sure you are making educated decisions, and if you are unsure ask the health professionals (GP, dietitian, pharmacist) so you know that you are making a right choice for your health. Continue to eat a balanced diet and if you are interested in meeting your micronutrient goals (vitamins and minerals) through your diet, book in to see one of us! That’s what we are here for! Previous post: Inflammation – Can your diet help?